HRWF (14.02.2019) – On 6 February, Dennis Christensen, a Danish Jehovah’s Witness living in Russia, was sentenced to 6 years in prison for leading a religious service in Oryol. 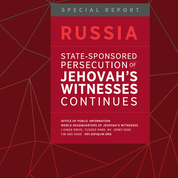 The Office of Public Information of the World Headquarters of Jehovah’s Witnesses has just published an impressive 28-page report about the magnitude of the repression they victims of: “Russia: State-sponsored Persecution of Jehovah’s Witnesses continues” (https://bit.ly/2tmTqIW). A week ago, official authorities and anti-cult activists in Russia started to launch a counter-offensive to justify the ban of Jehovah’s Witnesses. For this purpose, they have mainly used the media agency Interfax-Religion in Moscow which defends the viewpoints of the Russian Orthodox Church and the Kremlin. A first: They have been joined in their fight by China (!) as Bitter Winter has just discovered. Professor of Saint Tikhon’s Orthodox University of Humanities, Alexander Dvorkin, an anti-cult activist who is well-known for his hate speech towards a number of non-Orthodox religions, supports the persecution of Jehovah’s Witnesses in Russia and makes the religious movement responsible for the sentencing of Dennis Christensen. “As a human, I feel pity for Kristensen. He is another victim of heartless totalitarian sect, which prudently and cynically put him at risk, hoping that he will receive a prison term. Now they will use this case for their propaganda, and as a reason for increasing pressure on ordinary members of the sect: let your indices grow – Dennis Kristensen is suffering for you! Certainly, they use his imprisonment for intensifying the campaign on defamation of our country,” Dvorkin told Interfax-Religion in Russia on 7 February. Dvorkin wished Kristensen enlightenment and liberation “not only from the camp, but also from sectarian manipulations with minds,” and supposed that Danish Jehovah’s witness violated the law consciously. For many years, Dvorkin has been the vice-president of the FECRIS (European Federation of Research and Information Centers on Sectarianism), which is massively funded by the French authorities. This issue should be seriously questioned by those who in the current French government have been tasked in these difficult times to make the best use of the state budget and save money. On 12 February, Interfax-Religion in Russia interviewed Roman Silantyev, Professor and director of a special laboratory studying destructive challenges in Moscow State Linguistic University. “Recognizing this sect as extremist gave a possibility to dozens of our citizens to leave this concentration camp”, he said. “As to judicial decisions referring to Jehovah’s Witnesses I have information that this sect consciously pushes their members to crimes of such kind, in order to have a certain group of people really convicted for participating in them, to create a halo of martyrs for them and to exert pressure on Russia. So, I would urge the judicial authorities to use all opportunities in order not to give them real terms,” Silantyev told Interfax. According to him, in this situation it is better to fine sectarians, to conscript them to forced labor, but minimize the number of people really imprisoned for such cases. “We should not play along with Jehovah’s Witnesses”, Silantyev believes. The Russian Justice Ministry has described the rulings of Russian courts which branded Jehovah’s Witnesses as an extremist organization and prohibited its activity in Russia as founded and lawful, the ministry press service said in a statement seen by Interfax. The court ban on the activity of Jehovah’s Witnesses in Russia is not an act of religious persecution; the sole reason is their violation of Russian laws. “Nobody is being persecuted for religious reasons. The organization has been banned for activity which is against the law. Revoke the law and there’s no problem,” Lebedev said. “The situation is actually being presented as if these people are being persecuted for their belief and religious activity. Yet the decision, which was made by the Supreme Court amongst others, is unrelated to religion. It is about a violation of the law, which religious organizations have no right to breach,” Lebedev said. “Russia, however, can count on an “immediate and unconditional” ally of its own — China. The CCP is aware that the notion of “extremist religious movements” in China is substantially the same as the category of xie jiao in China. As Hong Kong scholar Ed Irons has noted, the “Chinese anti-cult Web site” is regarded in China as the voice of the CCP in matters regarding any group identified as a “cult” and its declarations enjoy a semi-official status. While the world was awaiting Christensen’s sentencing, this CCP-connected Web site published a detailed article in support of the Russian position on Jehovah’s Witnesses. “It is reasonable for Jehovah’s Witnesses to be strictly controlled or even completely banned”, the article stated. A laundry list of anti-cult accusations against Jehovah’s Witnesses was mentioned. The Chinese anti-cult Web site seems not to fully appreciate this difference. It supports the Russian position that Jehovah’s Witnesses should be banned because “they threaten the Russian mainstream religion: the reputation and living environment of the Orthodox Church” and are “eroding the foundation of the Orthodox Church”. That the Orthodox Church should be protected against its critics is a curious remark in a CCP publication, although within the CCP there are some who argue in a similar way that the monopoly on the Christian Protestant faith of the CCP-controlled Three-Self Church should be equally protected. Dennis Christensen was detained in May 2017, a month after Russia’s Supreme Court declared the Jehovah’s Witnesses to be an extremist group. Christensen was accused of continuing to ensure the work of the organization in Oryol, in the west of the country, despite knowing it had been banned. Criminal cases have since then been opened against more than 100 members of the Jehovah’s Witnesses, including at least 18 who are held in pre-trial detention. Others have been subjected to various measures of restraint, including house arrest and travel restrictions. The French government stops financing FECRIS.